The Putnam 9-1-1 Dispatch Center switchboard lit up like a Christmas tree when caller after caller reported a “man with a knife attacking another individual” on the Taconic State Parkway near Peekskill Hollow Road in Putnam Valley. Stat… Please login below or purchase a subscription to the Putnam County Courier to access this content. 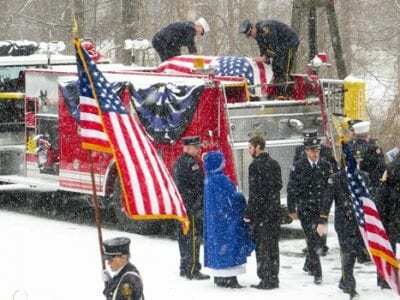 The flag draped coffin is hoisted onto the bed of a Lake Carmel FD engine outside Trinity Lutheran Church Saturday. Chuck Flickinger wouldn’t have had it any other way. The fifty-six year old 9-11 hero, who lost his battle to cancer on New Year… Please login below or purchase a subscription to the Putnam County Courier to access this content. 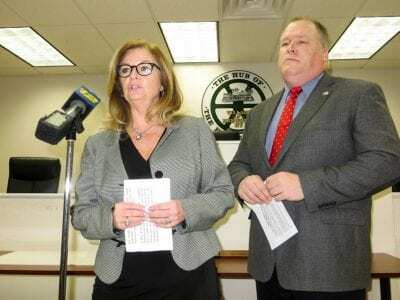 County Executive MaryEllen Odell addresses the news conference with Mayor James Schoenig . Brewster’s late Mayor John Cesar often talked about the “rebirth and renaissance of the Hub of the Harlem Valley.” That day has arrived, at last, thanks to a p… Please login below or purchase a subscription to the Putnam County Courier to access this content. Calvin and Hobbes get accustomed to their new surroundings Tuesday afternoon. The newest additions to the Tilly Foster Farm have arrived. 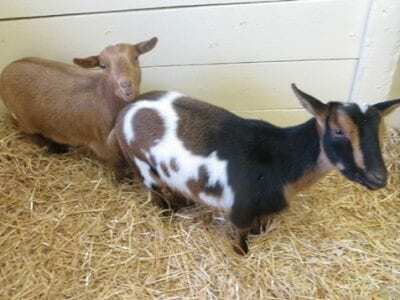 Calvin and Hobbes, two eight-month-old Nigerian Dwarf goats obtained from the Good Hope Farm in South Salem, are… Please login below or purchase a subscription to the Putnam County Courier to access this content. 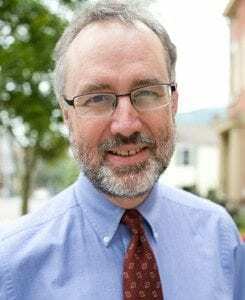 Record keeping in Philipstown, Cold Spring and Nelsonville entered the 21st century last month thanks to Putnam County being awarded a Local Government Records Management Improvement Grant that created an electronic document management system addres… Please login below or purchase a subscription to the Putnam County Courier to access this content. Above: Elliott Glenn shows off a rare image of a young Keith Richards of The Rolling Stones. 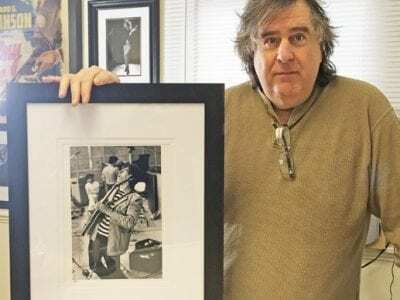 Below: The lost Bob Bonis Beatles pictures line the Gallery walls. The Beatles are widely regarded as the most influential band in rock music, and their cult… Please login below or purchase a subscription to the Putnam County Courier to access this content. Waterman Bird Club Sets Meeting; Cuba, Birds, Cigars? The Waterman Bird Club’s monthly meeting will be held Monday, January 23, at 7:30PM. Richard Guthrie, expert birder and host of WAMC Radio’s “Bird Talk,” will give a program called “Cuba-Birds-People-Cars- Cigars.” He r… Please login below or purchase a subscription to the Putnam County Courier to access this content. Winter session of Reading Buddies at the Kent Library If you’re in 1st through 4th grade, you can participate in Kent Public Library’s Winter session of Reading Buddies! Running from daily from January 9th through April 1st. Reading Buddies is a pr… Please login below or purchase a subscription to the Putnam County Courier to access this content. Sometimes, it’s most instructive to watch what happens when people get what they want. We are now at such a point with Gov. 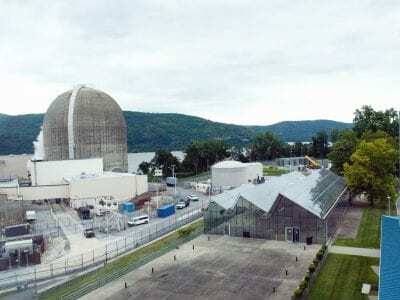 Andrew Cuomo, the environmentalists, and others who’ve agitated to force the Indian Point nuclear plants to… Please login below or purchase a subscription to the Putnam County Courier to access this content.